We have a full line of knit caps for babies and crochet baby hats. 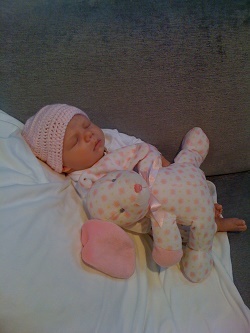 All of our knit and crochet baby hats are made with loving tender care. 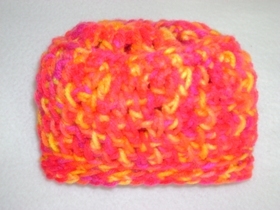 100% acrylic crochet and knit baby hats...machine wash and dry. 100% Organic Cotton baby crochet hat is in a Natural shade (no dye - free from herbicides, pesticides and other agro-chemicals)...good for your baby - and for the environment. Hand wash and lay flat. 100% Pure New Wool baby crochet hat comes in a Natural shade. Light enough for a cozy baby hat. Hand wash and lay flat. 20% Wool & 80% Acrylic baby crochet hat is a soft, warm blend of lamb's wool and easy-care acrylic...machine wash and dry. PREEMIE 100% acrylic crochet baby cap will provide extra warmth for your baby's head...to help maintain their body temperature. 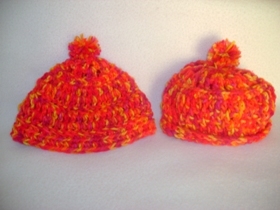 Below is a picture of each knit baby cap, a link where you can view the full knit caps for babies, and an ADD TO CART button. Crystal's cool baby hats/caps fit most infants 0-12 months. Babies come in different sizes...knit hats and crochet caps may not fit some babies who are closer to 12 months in age. Some newborns need a larger hat. Crystal has custom-made crocheted hats up to 10" (baby's head circumference)...same price $15. She can make any size...just measure your baby's head and send an email to Crystal. PREEMIE hats fit large preemie babies. Crystal's crocheted baby hats and knitted baby caps are SUPER CUTE! Baby caps and baby hats are a necessary part of a newborn's wardrobe. Every crocheted baby cap is unique. Each crochet baby cap and knit hat for babies may vary slightly as they are all carefully handmade by Crystal. If you have a preemie, email your baby's head size to Crystal and she will design an ultra soft, cool baby cap (in your color) just for your wee one...at no extra cost to you. If you need help in placing an order for a crochet baby hat or a knit cap for babies, please email Crystal at CrystalsBlankets@aol.com. Roll up hats can be worn DOWN or rolled UP for a different look! 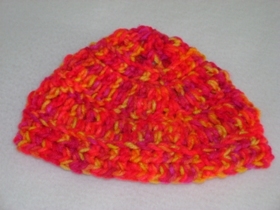 Crystal's super cute infant crochet hats and knit baby hats can be custom designed in different colors. If you would like a color other than what is listed, please email her at CrystalsBlankets@aol.com. Crystal's knit baby hat and crochet baby caps are made with ultra soft, high quality yarn. Crystal enjoys crocheting baby hats and knitting baby caps for little ones. All of her super cute baby caps and hats are made in the USA.